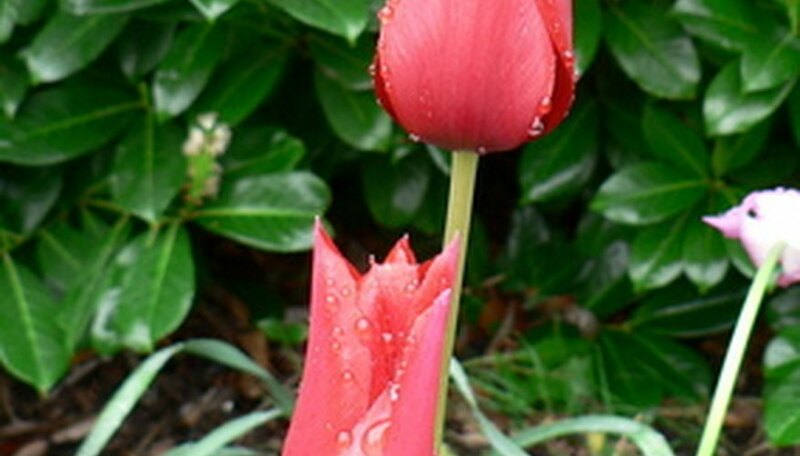 Planting flower bulbs requires planning to accommodate the specific bloom time of the bulb. The time of year to plant bulbs varies depending on whether they are spring and summer flowering bulbs. Each plant requires a specific amount of time to remain underground before producing foliage and flowers. In general, spring bulbs spend considerably more time slumbering beneath the soil due to specific growing requirements. Bulb plants differ from traditional landscape plants. Ornamental plants feature stems, branches and traditional root masses. Gardeners place ornamentals into the soil to cover the entire root ball with the foliage remaining above the soil level. Bulbs grow from a fleshy mass called a tuber. Everything needed to create a plant lies within the yam-like structure of a flower bulb. Two types of bulbs exist in the gardening world. Spring bulbs include many varieties that appear in early spring. These bulbs require a cooling period of at least six to 20 weeks before the plant produces shoots above the ground. Summer bulbs differ from spring bulbs in that these flowers don't require a slumbering period in cold temperatures. Gardeners plant summer bulbs in midspring for a flush of blooms in midsummer. Gardeners plant spring bulbs before the coldest part of the winter begins. Planting in the fall ensures a host of blooms as soon as the spring sun warms soil temperatures. In most cases, bulbs require at least 12 weeks to cool properly before producing foliage. Plant most spring bulbs in early October when you can work the soil easily. Never plant bulbs in the fall in soggy soil. This results in rotting bulbs and the complete absence of cheerful flowers the following spring. Summer bulbs grow quite readily in about four hours of sunlight each day. Plant summer bulbs in spring after the final frost of the year for a riot of colors during the summer. Unlike spring flowering bulbs, summer bulb plants do not need to cool for weeks before producing shoots. Accuracy in planting depth presents the primary concern for summer bulb planting. Follow instructions on the bulb packaging for the recommended depth. Bulbs need protection from the elements. A 2- to 3-inch layer of mulch shields summer bulbs from the intense heat of the sun. This same layer also protects tender spring bulbs from freezing during the winter. Some tender summer bulbs also need to be removed from the soil in cooler growing zones.